Over the years I have met countless instrument makers, professionals and amateurs, young and old, beginners and veterans. I’ve learned something from all of them; sometimes I wasn’t impressed and they showed me merely how not to work, some gave me great ideas and tricks, but others made a deeper impression. The maker that really rocked my vision on lutherie was Ken Parker. You are probably familiar with his “Parker Fly” an innovative electric guitar made out of light wood and a carbon/fibreglass composit. 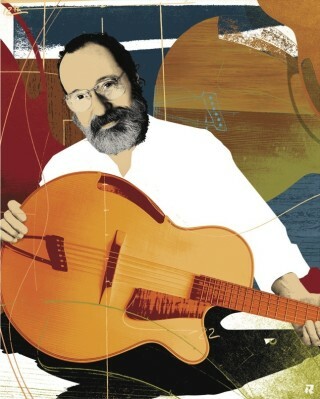 He later sold the company and started working on his own, renewing and revolutionizing the form of archtop guitars. Every two years the Centrum voor Muziekinstrumentenbouw (CMB) Puurs organizes a symposium called CordeFactum in a small castle in Hingene (Belgium). It centers around one of the instruments built at the CMB school. They invite instrument makers from around the globe to give lectures and workshops about their working methods. In the evening all makers gather in the cellar of the castle to share beer and knowledge in an informal setting. For the guitar-making edition of 2010 they invited a lot of interesting speakers. Ulrich Teuffel, Andrea Tacchi, Paul Fischer, George Lowden and Ken Parker. The lectures of the latter stood out for me. In two lectures (over the course of two days) and the opportunity to ask questions really was a blast, and it put my world upside down. All loose shards of information I already knew from making guitars and lutes suddenly fell into place and started to make sense. The lectures were a catalyst, like a force that sets a domino track in motion. A lot of assumptions I learned over the years proved to be false. Like the widely spread idea that “mass equals sustain”, a dogma that was held very close at the factory where I worked. Parker learned us that you need to make a guitar as light, but the neck also as stiff as possible. Newton learned us that mass is slow. And a guitar string has only one moment where it gets its energy, the plucking point, from then on the instrument has to do it on its own (a violin for example has a bow that constantly puts energy in the string). This little bit of energy has to drive the soundboard to bring the air in motion (a guitar is nothing more than a quite inefficient air-pump). You don’t want to waste it by setting a heavy brass bridge in motion, or disappear in a sloppy neck. Parker learned me that a good instrument is in balance, in agreement with itself. The materials, the strings, the player; all have an influence on the final sound. Also his notion that “a solidbody electric guitar is just a very quiet acoustic guitar” is something I can adhere to. Yes, you can change a lot with the elements, but it will be very hard to change a bad quality guitar in a sonic marvel only by swapping pickups. All instruments I’ve made ever since adhere to this principle. From the ultra-light Stradivari guitars, to the electric Danelectro models. Both have a relatively rigid neck, in relation to their light, resonant body. Parker was the direct opposite of this, giving everybody all information they desired; “Want to know what epoxy I use? Just the regular stuff from this manufacturer”. Plate thickness, arching, working methods, materials, designs, plans for the future. He was clear and transparent about everything. Unlike the company where I worked the quality of his instruments took the first place. He didn’t make any claims, but let the instruments speak for themselves. At the evenings in the castle bar the guitar he brought (Brownie) went around. “If you think it sounds better in the rooms above, just feel free to take it along, but please be gentile, because the instrument is sold already…” What? Sorry? You make a thirtythousand dollar instrument, put in the hands of somebody you don’t know, and just say to take it along and try it out? I was astonished by this trust, simply because of the concealed suspicion I knew from the company I worked. On the other hand, there simply is no need to protect these ‘secrets’; when somebody else makes a guitar like that, or even a close copy it still won’t be the same. Most guitar companies weapon up and try to defend themselves with legal eagles, desperately suing everyone who even attempts to look at their patents. But this is a waste of money, energy and time. When you make something on the very edges of what’s possible, something that’s right in balance, it will be to difficult for others to copy or translate into mass production. There are thousands, millions of copies of the Mona Lisa, but just one original, painted by Leonardo himself. Like I said, meeting Ken Parker made a lasting impression. On one hand it was the indirect cause of my burn-out, helping me to realise that what we were doing at the company led nowhere. But on the other it set things in motion, like an epiphany, everything suddenly made sense. Two of my main projects (the “Making Masonite Guitars”-book and Stradivari article), are a direct result of it. In just two days I learned more about instrument making than in all the years before. Not only the technical part, but also the value(s) the instrument represent. The work of a craftsman, risking everything to push the boundaries of his craft. exploring, learning and making something truly great! Click on the picture on the left for an article in Premier Guitar. Click here to read the NewYorker article, or here to read an article from Just Jazz Guitar about the Parker archtops. This entry was posted in Articles, Documentary, Lectures, Research, Think different and tagged Crafts, Education, Guitar, Inspiration, Learning, Lutherie, Making, Quality. Bookmark the permalink. Wow, what an awesome article. I am going search out more on Ken Parker. The first time I met Ken in Montreal I expected to meet a stuffy, arrogant, and holier than thou individual. He was about as far away from that as you could imagine. Warm, funny, and like someone you had known for a lifetime. He is down to earth and is one of greatest luthiers on the planet. As far as trust goes, just like your article says he let anyone try out his guitar. Handing over a $30K instrument to anyone who would like to try it. It was hands down the best guitar I’ve ever played. He is awesome in many ways.